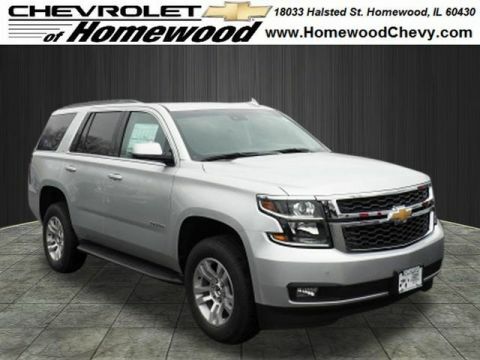 2019 Chevrolet Tahoe LT Silver Ice Metallic 2019 Chevrolet Tahoe LT 4WD 6-Speed Automatic EcoTec3 5.3L V8 4WD, Black Leather, ABS brakes, Alloy wheels, Compass, Electronic Stability Control, Front dual zone A/C, Front Heated Reclining Bucket Seats, Heated door mirrors, Heated front seats, Illuminated entry, Low tire pressure warning, Power Liftgate, Power-Adjustable Accelerator & Brake Pedals, Remote keyless entry, Traction control. 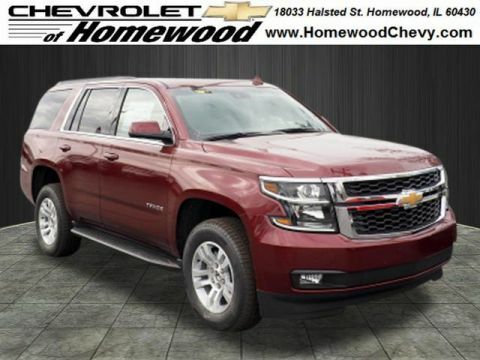 2019 Chevrolet Tahoe LT Red Tintcoat 2019 Chevrolet Tahoe LT 4WD 6-Speed Automatic EcoTec3 5.3L V8 4WD, Black Leather, ABS brakes, Alloy wheels, Compass, Electronic Stability Control, Front dual zone A/C, Front Heated Reclining Bucket Seats, Heated door mirrors, Heated front seats, Illuminated entry, Low tire pressure warning, Power Liftgate, Power-Adjustable Accelerator & Brake Pedals, Remote keyless entry, Traction control. 2019 Chevrolet Tahoe LT Velvet 2019 Chevrolet Tahoe LT 4WD 6-Speed Automatic EcoTec3 5.3L V8 4WD, Jet Black/Dark Ash Leather, ABS brakes, Alloy wheels, Compass, Electronic Stability Control, Front dual zone A/C, Front Heated Reclining Bucket Seats, Heated door mirrors, Heated front seats, Illuminated entry, Low tire pressure warning, Power Liftgate, Power-Adjustable Accelerator & Brake Pedals, Remote keyless entry, Traction control. 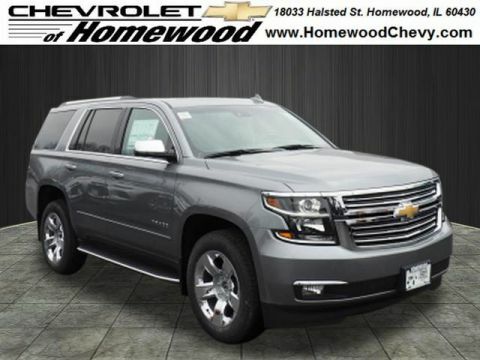 2019 Chevrolet Tahoe LT Shadow Gray Metallic 2019 Chevrolet Tahoe LT 4WD 6-Speed Automatic EcoTec3 5.3L V8 4WD, Black Leather, ABS brakes, Alloy wheels, Compass, Electronic Stability Control, Front dual zone A/C, Front Heated Reclining Bucket Seats, Heated door mirrors, Heated front seats, Illuminated entry, Low tire pressure warning, Power Liftgate, Power-Adjustable Accelerator & Brake Pedals, Remote keyless entry, Traction control. 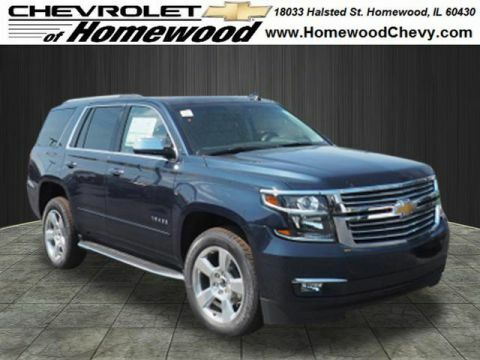 2019 Chevrolet Tahoe Premier New Price! 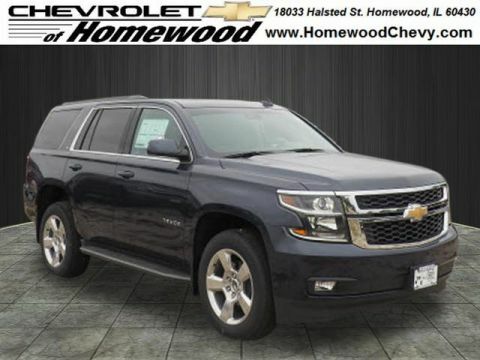 Velvet 2019 Chevrolet Tahoe Premier 4WD 6-Speed Automatic EcoTec3 5.3L V8 4WD, Cocoa/Dune Leather, ABS brakes, Alloy wheels, Compass, Electronic Stability Control, Fog Lamps, Front dual zone A/C, Front Heated Reclining Bucket Seats, Heated 2nd Row Seats, Heated door mirrors, Heated front seats, Heated rear seats, Illuminated entry, Low tire pressure warning, Power Liftgate, Power-Adjustable Accelerator & Brake Pedals, Remote Keyless Entry, Remote keyless entry, Traction control.Recent Arrival! 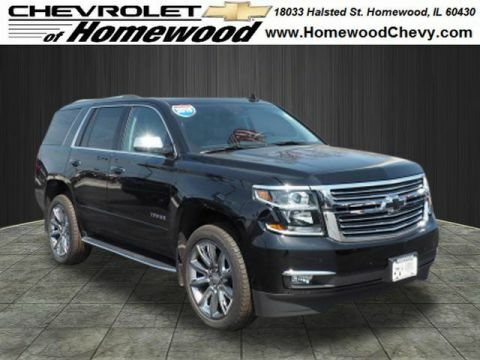 2019 Chevrolet Tahoe Premier Steel Metallic 2019 Chevrolet Tahoe Premier 4WD 6-Speed Automatic EcoTec3 5.3L V8 4WD, Jet Black Leather, ABS brakes, Alloy wheels, Compass, Electronic Stability Control, Fog Lamps, Front dual zone A/C, Front Heated Reclining Bucket Seats, Heated 2nd Row Seats, Heated door mirrors, Heated front seats, Heated rear seats, Illuminated entry, Low tire pressure warning, Power Liftgate, Power-Adjustable Accelerator & Brake Pedals, Remote Keyless Entry, Remote keyless entry, Traction control. 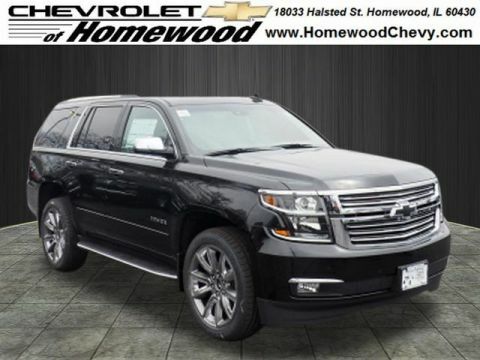 2019 Chevrolet Tahoe Premier Black 2019 Chevrolet Tahoe Premier 4WD 6-Speed Automatic EcoTec3 5.3L V8 4WD, Jet Black Leather, ABS brakes, Alloy wheels, Compass, Electronic Stability Control, Fog Lamps, Front dual zone A/C, Front Heated Reclining Bucket Seats, Heated 2nd Row Seats, Heated door mirrors, Heated front seats, Heated rear seats, Illuminated entry, Low tire pressure warning, Power Liftgate, Power-Adjustable Accelerator & Brake Pedals, Remote Keyless Entry, Remote keyless entry, Traction control. 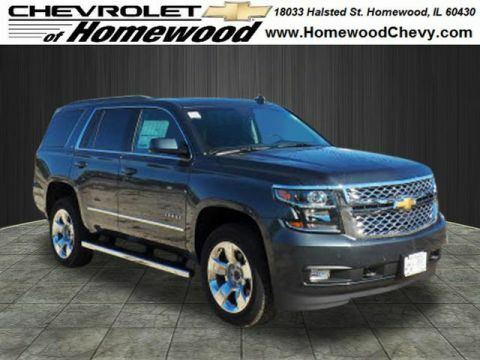 Why Buy the New Chevrolet Tahoe at Chevrolet of Homewood? 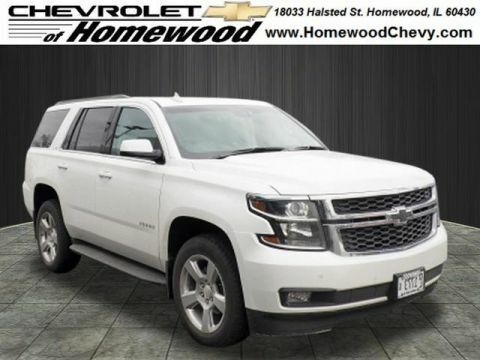 Stop by our showroom at 18033 Halsted St Homewood, IL 60430 to see the new Tahoe in person, or schedule a test drive to get in the driver’s seat!